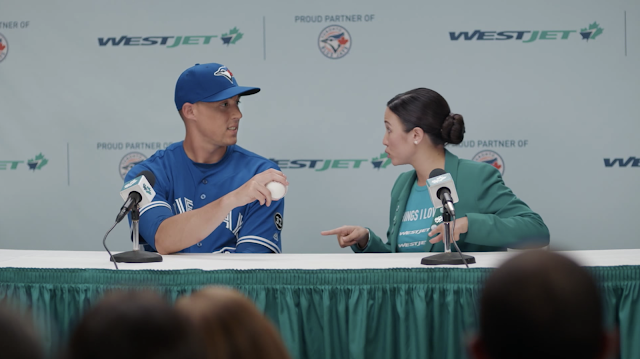 With the first pitch of the Toronto Blue Jays Honda Opening Day, WestJet debuted a new round of television ads featuring pitcher, Aaron Sanchez, television play-by-play announcer for the Toronto Blue Jays, Buck Martinez and Marci, WestJet super fan. For a glimpse of what a super fan is, please visit the WestJet blog. Created by WestJet and their creative content agency, studio m, the six ads feature Sanchez at a WestJet/Blue Jays press conference where Martinez is attempting to ask the Toronto Blue Jays pitcher questions about the upcoming season and partnership with WestJet. Good news for Sanchez, super fan Marci is there to give the inside pitch on WestJet dollars, non-stop destinations and Plus fare benefits. Watch the ad series here. "The Toronto Blue Jays have created super fans across Canada," said Richard Bartrem, WestJet Vice-President, Marketing Communications. "And WestJet is no stranger to them as well. Putting it all together through Marci's enthusiasm in our ad series made sense to help drive awareness of key WestJet products during a favourite Canadian pastime – cheering on the Jays. We are proud to once again work with Aaron Sanchez and introduce Canadians to WestJet super fan, Marci." The ads launch on March 29 and will be broadcast on Sportsnet during Toronto Blue Jays games throughout the baseball season. Fans looking for more content along with the game schedule and corresponding WestJet flight schedule can also check out the WestJet Blue Jays hub. WestJet has been the airline partner of the Toronto Blue Jays since 2012 and is proud to announce that WestJet Vacations is now the official vacation travel partner of the club. WestJet continues to work with the Blue Jays to enhance the guest experience for fans of Canada's only major league baseball team and will once again be treating Blue Jays fans to amazing experiences in the WestJet Flight Deck at Rogers Centre.